A leaked early prototype video of Mass Effect: Andromeda shows the game will have jetpacks to allow you to jump on top of buildings. 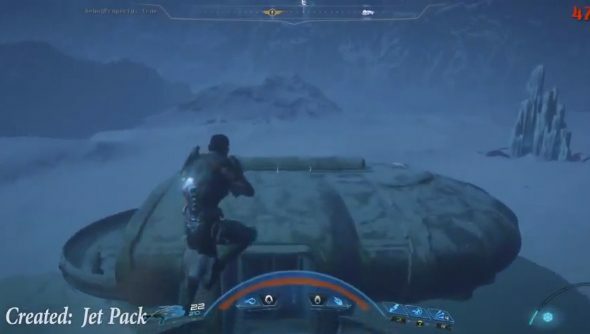 The video (below), which shows a prototype build of the game from around 2014, was obtained from the VFX showreel of an unnamed developer working on the BioWare title by a detective on NeoGAF. Using EA’s proprietary Frostbite engine, the developer shows off volumetric plumes of a seemingly poisonous pollen squeezed from a pod by a Krogan during a cutscene. It also showcases the lighting effects of a jetpack on the player model allowing them to scale a building, whilst giving another glimpse of the HUD. 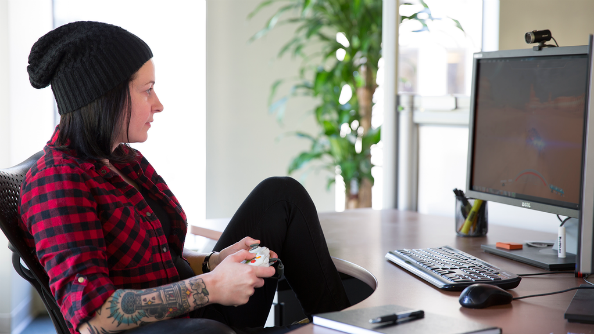 The arching HUD at the bottom of the screen has been previously teased in a photo from late 2015 (below) depicting BioWare Montreal studio manager Marie Brisebois playing the development build. A further leak from a survey sent out earlier this week suggests the plot of the game will revolve around humans attempting to colonise the Andromeda Galaxy. This is a far cry from the anti-colonial sentiment of the original trilogy in which every race in the Milky Way combines to fight off the encroaching Reaper apocalypse.